Continuing our ongoing MacBook comparison series, we pit the 2017 12-inch MacBook against the 2018 13-inch MacBook Air, the latter of which was recently revamped with a refreshed design, Retina display, Touch ID and more. Starting with design, both the 12-inch MacBook and MacBook Air feature iconic wedge shape chassis, a silhouette introduced with the original Air more than ten years ago. In terms of portability, the MacBook obviously beats out the larger 13-inch Air, with a much smaller, thinner and lighter chassis. That said, the Air is not a beast by any means, having had both its footprint and weight reduced from last year's iteration. Both MacBooks pack a 2,560-by-1,600 pixel resolution display, but the 12-inch MacBook's screen gets quite a bit brighter than the one on the Air. The 13-inch MacBook Air also lacks contrast and looks more gray in comparison. FaceTime cameras are embedded in the top bezel of each Mac, though the 12-inch MacBook's 480p module is a far cry from the 720p HD unit in the 13-inch MacBook Air. Microphone quality on the Air is much better as well. Both models have Force Touch trackpads, with the Air's being a bit larger. As for keyboards, the Air features Apple's third-generation butterfly switch keyboard, which includes a silicone barrier beneath the keys to help block debris from getting in the mechanism. The 12-inch MacBook was introduced last year and comes with Apple's second-generation keyboard that is more prone to failure. Expandability is constrained on the 12-inch MacBook and its single USB-C port. The Air, on the other hand, has two Thunderbolt 3 ports that are capable of transferring data at up to 40 Gbps. You can also connect peripherals like eGPUs and external monitors to the Air for a better desktop computer experience. 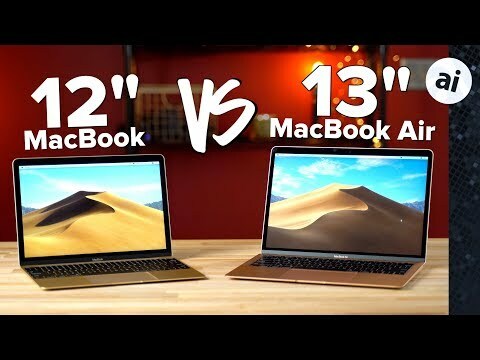 The MacBook edges out the 13-inch MacBook Air in terms of thinness. As usual, Apple improved on its speaker design with this year's Air. Compared to the MacBook, Air's speakers are louder and boast more bass. Unlike the 12-inch MacBook, the MacBook Air comes with Touch ID, which is nice addition for keeping your computer secure. It also enables Apple Pay. Touch ID means Air gets Apple's T2 security chip. The custom silicon handles SSD encryption and other system tasks, including repair authorization for certain critical parts like Touch ID and the logic board. The MacBook Air scored 20 percent higher than the 12-inch MacBook in Geekbench 4's CPU test, and 22 percent higher in the GPU evaluation. Based on this, the Air seems to perform quite a bit better, and it also has a fan to cool the system down. Interestingly, the fan isn't actually connected to the processor's heatsink like it is in the MacBook Pro or even the old MacBook Air. To test the thermals, we performed Cinebench R15's CPU test runs back-to-back while using Intel's Power Gadget to keep an eye on the temperatures. The 12-inch MacBook averaged 253.8 points after five runs, and the processor floated at around 95 to 99 degrees Celsius. The 13-inch MacBook Air averaged 261 points and it stayed at around 99 to 100 degrees Celsius basically the entire time. Notably, the Air's 20 percent Geekbench lead dropped all the way down to 3 percent while stress testing, and the Air's fans were blowing pretty loudly the whole time. In terms of battery life, the Air will get you 12 hours compared to only 10 on the 12-inch MacBook, mostly due to a larger battery. If you do a lot of traveling or you just want to have an ultra portable laptop, then get the 12-inch MacBook. The $1,299 base price nets a better display, completely fan-less design and larger 256GB storage drive when compared to the 2018 Air. If you're someone who wants the best battery life, need extra ports and Thunderbolt 3, like to video chat and want the latest technology like Touch ID, T2 and the third-gen keyboard, then the 13-inch MacBook Air is the correct choice. Apple authorized resellers are currently discounting both the 12-inch MacBook and 13-inch MacBook Air, putting the standard models of each within $50 of one another. The 12-inch MacBook is also seeing instant and coupon savings of up to $150 with prices starting at $1,149 with coupon code APINSIDER at Adorama. Prices on these and every other Mac can be found in our Apple Price Guides. The single USB port on the 12” MacBook is one of the stupidest design decisions made in a long time. That feature alone creates enough usability issues to remove it from consideration. I haven’t found it to be a problem. Most USB-C hubs have pass-through charging now, and third party hubs are now plentiful. Based on the Cinebench scores, I’m going to guess that the fan isn’t to cool the CPU, but instead to provide thermal capacity for Thunderbolt and the T2 chip. That’s likely why it isn’t connected to the CPU’s heat sink. Yet again, Intel’s thermals only allow consistent performance in a desktop format. Marketing TDP at base-clock, when it has to sweat like a fat bloke as soon as any real work’s to be done, is fraudulent. ARM/Custom architecture is ‘fit’ for portable/mobile purpose. Apple needs to move on. That's the problem - you need to carry a hub in addition to whatever else you plug in, so a basic-use scenario of needing to charge your laptop and use a flash drive or other accessory at the same time requires you to purchase and carry a separate hub. I know of no other laptop on the market that forces you to choose between charging and using an accessory. Adding one more USB port (or, God forbid, keeping the MagSafe connector for charging) would completely eliminate the problem. Of course, I need to carry a USB A-C dongle as well, so I might as well just get an extra bag to carry all the accessories. Hey Vadim - Where is the link to the one you recommend? "so I might as well just get an extra bag to carry all the accessories" Can't you just put the dongle and/or hub in the same bag you're using to carry the charger, cable and USB key? Or is there no room left after you stuff in your bottle of whine? I don't understand how do you still make such rough mistakes: what people understand from the above statement is that you cannot connect external monitors to the Macbook !.. "Dual display and video mirroring: simultaneously supports full native resolution on the built-in display and up to 4096-by-2304 resolution at 60Hz on an external display, both at millions of colors"
I have a lightweight hub that’s about 4” x 2” x 1/3” that has 3 USB-A ports, Ethernet, HDMI, and pass-through charging. It’s about $50 on Amazon and does everything I need it to. Well at the least it's a little hypocritical after removing the headphone jack from the iPhone, to keep it on the MacBook rather than offer a second, far more useful, USB-C port. Both MacBooks pack a 2,560-by-1,600 pixel resolution display, but the 12-inch MacBook's screen gets quite a bit brighter than the one on the Air. Left over or copy and paste error from the MBP v MBA article? The MB12 has a 2304-by-1440 display. It’s working as Intel is advertising: TDP is for sustained performance of the processor. Ie, it guarantees base clocks at 99 °C, or TDP power draw. The big issue are the mediarati saying that it throttles when it goes to base clocks after heating. That’s not throttling. That’s the behavior of the processor as designed. Yes, that's exactly my point. Using a flash drive and charging your computer at the same time is not moving your entire desk. You ask why people would need an 'integrated hub' in their laptop - well, that's exactly what every laptop with more than one port is. Even a $250 chromebook lets you do this. When Apple made the decision to handle charging via the USB port, they essentially made the MacBook a 'one port' hub for both charging and data transfer. Had they kept charging separate from the USB it wouldn't be an issue. By putting everything into a single port, the limit you to one function at a time unless you choose to purchase a separate hub and carry it around wherever you take your MacBook. No -no room because it's full of the clues you don't have. I hear your Mpls...but I have to tell you, I bought a USB to USBC connector (about 3/4's of inch long) and I've used it once on my 2017 MacBook. Mainly b/c I bought an external HD for back-ups. But, I rely now on iCloud. All due respect...the AirPods are magnificent! I have a little app (ToothFairy-$2) that sits in my MacBook's menu bar that syncs them instantly. P.S. Apple hates swappable batteries, media cards, heft, thickness, physical media, buttons, wires, power bricks, non-retina displays and sorry, superfluous ports. I think Apple will keep the MacBook. It's their flagship notebook...read emphasis on portability and elegant design. If everyone would stop 'belly-aching' about it...It's really what a laptop should be, i.e., super light and thin! Just add the new larger trackpad, latest KB, reduce the bezels, remove the headphone jack and add TouchID and it's a winner! Best laptop I've ever owned! Oh and keep the rose gold! Oh, OK. I thought you had a video explaining why you recommended that MacBook Pro. I musta misunderstood your video. Good video otherwise by the way!